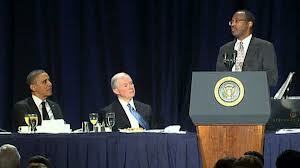 Dr. Benjamin Carson, holder of the Medal of Freedom, shocked President Barack Obama as he spoke against political correctness and the horrendous debt facing our nation at the National Prayer Breakfast. Obama sat emotionless just a few feet from Dr. Carlson as he torn apart the President’s agenda. On the issue of ObamaCare Dr. Carson, standing just feet from the president, criticized higher taxes and advocated changes that promote personal responsibility such as life time Health Savings Accounts (HSA). “Here’s my solution: When a person is born, give him a birth certificate, an electronic medical record, and a health savings account to which money can be contributed — pretax — from the time you’re born ’til the time you die,” Dr. Carson proposed. “If you die, you can pass it on to your family members, and there’s nobody talking about death panels. We can make contributions for people who are indigent,” he continued. Most importantly Dr. Carson’s solution would not infringe on the religious beliefs of citizens or force employers to furnish abortion and other services distasteful to them.